I suppose we asked for this. 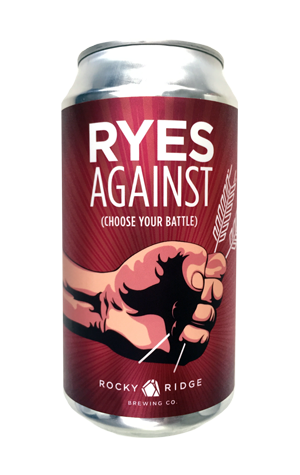 Quips in previous reviews that hinted at an unintentional Rocky Ridge "Classic Rock" series now appear to have manifested in another, more contemporary edition, Ryes Against. The similarly named Chicago punk band is a favourite of incoming head brewer Ross Terlick and, although the predominantly straight edge members may not appreciate the accolade from the Jindong brewery, it is further evidence of loud, ringing solos melding with water, malt, yeast and hops. An opening salvo of sweet malt and tropical aromas leads to an implied grainy character and rye spice create layers of complexity that mingle with the firm bitterness. The use of a NEIPA-style yeast contributes to mouthfeel, as does the lean carbonation, although the beer remains relatively clear. Alcohol presence rises, along with bitterness, through its length towards a lingering dry coda.